From Villanueva de Cauche you have a northern and a southern option for the GR7/E4. 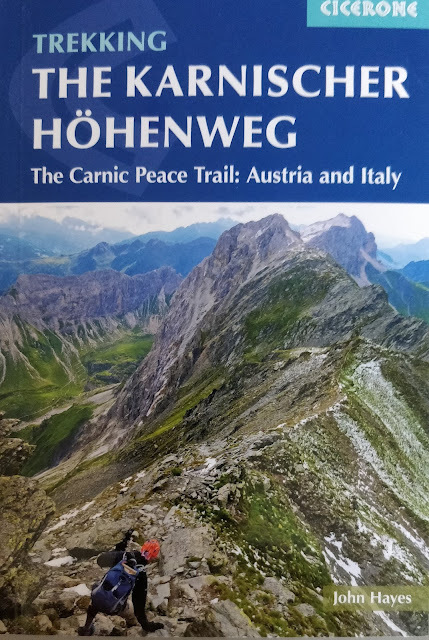 I chose the northern option, which is generally described as the less developed route, because, and without a lot of evidence, I thought there might be snow on the southern route in March. I now know better and could definitely have walked either route. In total my Stage 2 is 443 kilometres long, involves around 112 hours walking, and goes from Villanueva del Rosario through the Malaga and Jaen provinces and joins up with the southern option at Puebla de Don Fadrique where both options join before heading into Murcia. There are a lot of olive trees along this part of the walk. Spain is the world's largest producer of olive oil and this part of Andalucia (Jaen in particular) is where much of it happens. To be honest I got a bit fed up with olive trees. Day one was mixed arable, not yet 100 per cent olive trees, and while it wasn't brilliant walking the trail was nearly all off-road. I stayed at the wonderful Hotel Rural Paloma which is just off the route and couple of kilometres before you get to Villanueva de Tapia (near where the route crosses the main road) - don't miss it! The next day, a short 20 kilometre walk but now 100 per cent olives. Pleasant open countryside but olives as far as the eye can see. Villanueva de Algaidas, the day's destination looked a pretty dull town, although it was pouring with rain when I arrived. The Hotel Algaidas is at the southern end of the high street. After the rain the walk from Villanueva de Algaidas to Rute was tricky and sticky (with argillaceous mud sticky to everything). Streams which needed to be crossed were in full flood and the route was at times very difficult to follow. This was a shame because, despite the olive trees, this is pretty countryside with the route taking you through the lovely villages of Cuevas Bajas and Vadofresno. Rute the final destination is also interesting, a centre for the production of anis, the whole town seemed to smell just slightly from the drink. I stayed at the Hotel el Mirador which was OK but lacked any Spanish soul. Nice walk to the lovely town of Priego de Cordoba the route takes you along two linked valleys. Hard to find the route leaving Rute but important that you do as the route takes high up the side of the first valley and away from the road. In the second valley it's along a quiet road still annoying because there is a lovely green lane running parallel to it nearly all the way. Preigo de Cordoba is a lovely town with some amazing Rococo churches. Stayed at the Hostal Rafi, a really nice hotel with a good restaurant. After a 23 kilometre walk to Priego de Cordoba I chose to do a much longer, 35 kilometre walk to Alacala la Real. Could have had a short day by stopping at Almedinilla but to be honest the walking was not that good so not that much to hold you back. Quiet a lot of road walking although at times I may have walked along the road rather than the path because I missed the route. Stopped for half a day in Alcala la Real staying at the Hotel Torrepalma. Impressive castle towering over the town and from the top you can see the line of watch towers that marked an old border with the Moors. A short afternoon stroll took me through the Alcala la Real suburbs to Frailes with accommodation at a wonderful bar in the middle of the village, really friendly, enormous portions of food and great fun. 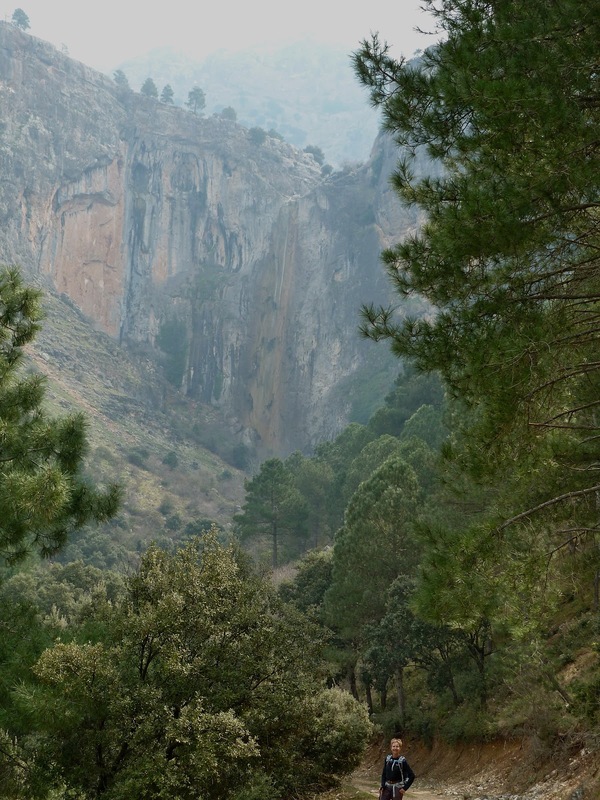 Frailes to Carchelejo is a big but wonderful walk, 35 kilometres and 1300 metres of ascent. Climbing steadily up from Frailes to the little village of Los Rosales your soon out of olive country and into open moorland where the agriculture is based on sheep. Climbing up over a ridge with brillant views to the north you then into a empty and seemingly never ending valley before, after several hours, climbing up again over a ridge, past some amazing wind blown rock, with brilliant views of the Quiebrajano Reservoir, before getting onto moorland again and heading down to Carchelejo. We stayed at the Mezquita de Magina Rural Apartments, whatever you do don't be tempted to walk onto the Hotel-Restuarant Oasis, its miles away. Couldn't find anywhere to stay at Cambil, the walk for the next day, but the owner of the Mezquita in Carchelejo was happy to act as taxi driver. Easy walk to Cambil, a very pleasant little town, although you do have to go underneath a motorway. Recent comments on the blog suggest that the route may have got washed away in places so it might be necessary to make some local enquiries, as it was, even when we were there, the river along the valley looked a bit treacherous. After a slightly dull walk to Cambil, the walk to Torres next day was much better. Again you get to climb up out of the olive trees, this time into the Sierra Magina Natural Park, over a pass a 1600 metres with some amazing views back to the Sierra Nevadas, and then a long meandering walk down through trees to Torres. A good walk. Stayed at the Hotel-Restaurante Jurinea which was excellent. The walk to Jodar is a good one going through some nice countryside and visiting the lovely towns of Albanchez de Ubeda and Bedmar both of which are stop-over options. Jodar is an "interesting" place, nice town centre but the rest of the place feels poor and slightly oppressive. 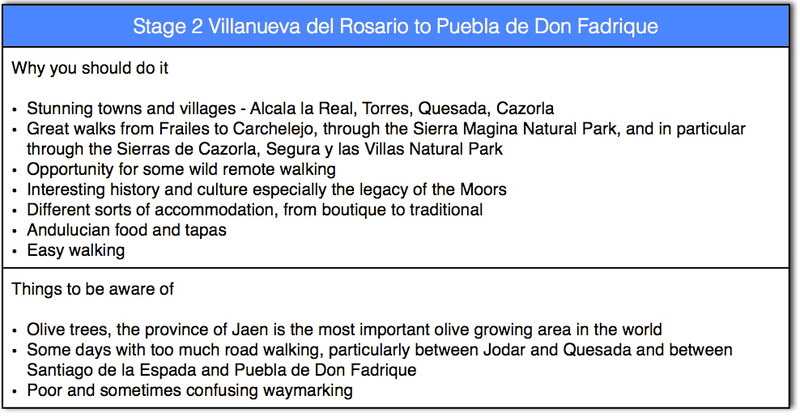 There are two hotels and we probably stayed at the wrong one - would try the Hotel los Molinos which is much better positioned than the Hotel Cuidad de Jodar. Would give the walk to Quesada a miss unless you're desperate to do the whole of the GR7/E4. A lot of road walking through boring olive tree country. Gets better from Hornos de Peal to Quesada and Quesada is a lovely village with good accommodation options. We stayed at the excellent Hotel Sierra de Quesada. After Quesada you enter the Sierras de Cazorla, Segura y las Villas Natural Park, a magical place full of wild life but with a total absence of people when I went there in March. This was one of the best parts of the whole E4 as far as I was concerned and as well as deer, huge numbers of birds of prey and vultures, I got to see my first wild boar and either a wild cat or a lynx. Definitely want to go back there. You cross into the Park somewhere between Quesada and Cazorla after you have climbed up along a forest trail. The scenery changes quickly with huge limestone cliffs looking into the park and huge views across the plain looking out. Along the way you pass ancient churches and castles before getting to Cazorla which itself is an absolute gem of a town. We stayed at the Hotel Guadalquivir which was a success. Sticking with the route there is no accommodation on the route into the park so I walked to and from Vadillo de Castril and the hotel gave me a lift back there the following day. I'm sure there are better options if your not a GR7/E4 purist. The paths through the park were excellent, a combination of paved mule trails and more recent forest trails. It was on the second day into the park that the wild life started to reveal itself in numbers. Usually walking high up, contouring around valleys, you're often looking down at the hovering Griffon vultures and birds of prey. It was on the second day I saw my family of wild boar. I stayed in an apartment in Cotos Rios, a small village on the edge of the park, although I'm sure the Hotel la Hortizuela is close by but on the road on the other side of the river from the trail. Although you're out of the park the quality of walking is more than sustained next day on the trip to Pontones. It was pretty wild when I did it with snow falling going over the pass. It was at this point I saw what was either a Lynx or a Wild Cat. Pontones itself is very much a mountain town, very remote and in an area where making a living looks especially hard. The Hotel Restaurant Ruta del Segura was a authentic, old fashioned good fun place to stay. 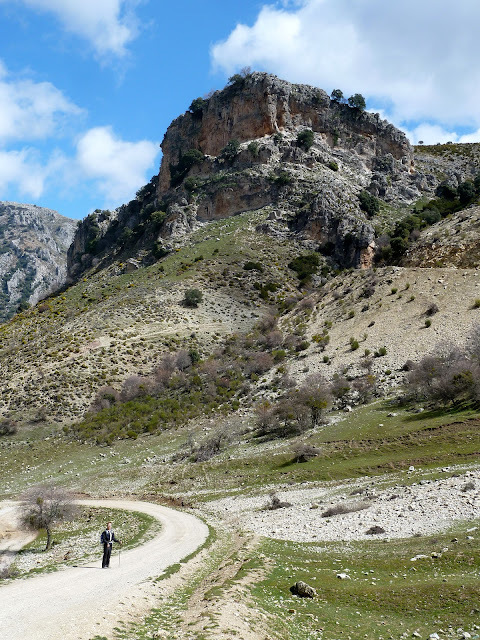 Last decent day's walking on the northern variant of the GR7, a walk across dry open limestone countryside followed by a long descent down a valley to Santiago de la Espada. Stayed at another mountain hotel, the Hotel San Francisco. Although I walked to Puebla de Don Fadrique there was little pleasure in it. Mostly along a sometimes busy road and a long way - would definitely recommend catching the bus. The Hotel Puerta de Andalucia is a good place to spend a last day in Andalucia (or a first day if you're walking the other way). If you want to know what the walk felt like on a daily basis then have a look at the walk diary. Having previously walked the southern variant I will have to try the Northern. Your pics have persuaded me! But first I have to finish the Gr7 in Valencia and Catalonia - will be returning in November despite the snow. Hi John, nice to hear from you. How did you get on with the accommodation on the Alicante bit of the GR7? Haven't been yet - went rock climbing in Valencia instead!! Planning a week or so in November usually find the weather OK, ie not too hot. Hi both Johns, can any of you compare nothern and southern route by now and tell me which one you preferred? I'm planning to start the trail in Tarifa in February, do you think that'll be possible? I would go with the southern route - particularly in February. It can be very wet on the northern side and muddy. On the southern side, towards the end there is a pass and there will be snow in February but there is a road alternative. Either way have a great trip. Hi John, thanks for the quick answer, unfortunately I didn't get a notification about it. So you originally wrote that you chose the Northern route because you thought it would be snowing on the Southern one - did that turn out to be wrong? If the Southern route is higher in general, isn't the chance of rain/snow/mud higher as well? Yes that was wrong. There is much less precipitation in general on the southern side. Okay, that is very good to know indeed :D Thanks.